Element mills offer a wide range of feed back options for roll positioning that provide tight output tolerances. Our most accurate design incorporates non contact positive roll detection that can provide output to tolerances of better than +/-0.0001″ (+/- 4um). Rolling mill can have multiple different configurations that are used depending on material type, thickness and yield strengths. Element has built a wide variety of rolling mills to fit multiple applications. 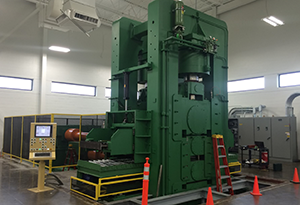 Element has designed and built multiple 4 high rolling mills for a wide variety of applications from foil processing to individual piece rolling. These machines have ranged in separating forces from 100 UST (90 MT) to 1000 UST (907 MT), handle strip widths from 2″ (50.8 mm) to 120″ (3.048 m) and reduce strip thicknesses from 0.00025″ (0.0063 m) to 2″ (50.8mm). 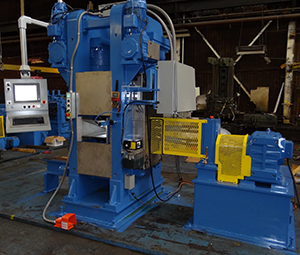 These 4 high rolling mills have utilized hydraulic, pneumatic or electromechanically actuators. Our mills can be supplied as standalone equipment for individual piece reductions or as part of our total line of equipment with coil processing material handling equipment.